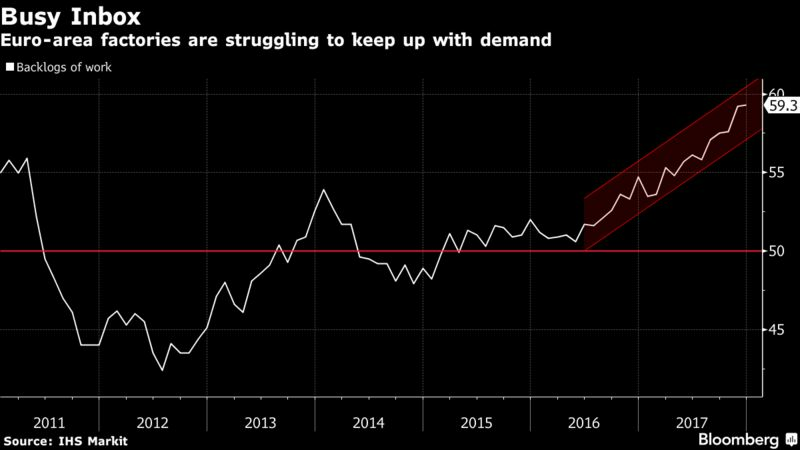 Factories across the globe warned they are finding it increasingly hard to keep up with demand, potentially forcing them to raise prices as the world economy looks set to enjoy its strongest year since 2011. Purchasing Managers Indexes from China, Germany, France, Canada and the U.K. all pointed to deeper supply constraints. Such strains on potential output may mean companies have to hire or invest more to avoid overheating, yet it could also force them to push up prices. Factories across the globe warned they are finding it increasingly hard to keep up with demand, potentially forcing them to raise prices as the world economy looks set to enjoy its strongest year since 2011. Such strains on potential output may mean companies have to hire or invest more to avoid overheating, yet it could also force them to push up prices, propelling inflation enough to squeeze the expansion. JPMorgan Chase & Co. is among the banks predicting global growth will be around 4 percent this year and on Tuesday said its composite of PMI reports from around the world had reached the highest since February 2011. Government bonds fell around the world as traders moved to price in the prospect of quickening inflation. The yield on 10-year Treasury notes increased four basis points to 2.45 percent while the 10-year break-even rate, a gauge of the outlook for consumer prices over the coming decade, approached 2 percentage points for the first time since March. In Europe, the five-year, five-year inflation swap rate increased to the highest level since February. In the U.S., the IHS Markit PMI rose to 55.1 from 53.9 in November, while the euro-area index was at a record 60.6. The euro-zone report showed both new orders and output were the best in 17 years as exports gained. 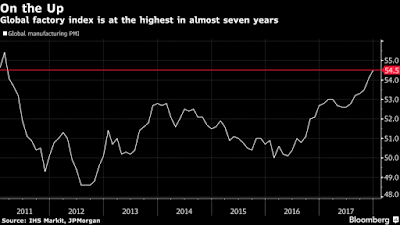 Germany’s gauge rose to a record and France improved. Canada reached a three-month high of 54.7 on stronger new orders. Global growth also got a boost from a solid reading in China’s manufacturing sector. With industry at its limits, there are implications for inflation in the euro region, which remains below the European Central Bank’s target of just under 2 percent. Bundesbank President Jens Weidmann, who wants to set an end-date for monetary stimulus, recently cited regional bottlenecks as setting the stage for stronger wage growth. The U.S. Federal Reserve raised interest rates three times last year and, according to officials’ median forecast, has penciled in another three this year on the expectation that inflation will move back toward its 2 percent target. “The combination of strengthening growth, a solid labor market and rising prices will add to expectations that the Fed will remain on track for another rate hike in the near future, with March looking a likely possibility,” Williamson said. Input costs remain elevated across a number of economies, partly reflecting higher raw material prices. In China, the Caixin factory PMI rose to a four-month high and there was faster growth of output, total new work and export sales, as well as an increase in backlogs. An official PMI weakened slightly, though remained above the key 50 level that signifies expansion. car brand said last Friday that production reached a record high last year with global output of more than 6 million vehicles, while Philippe Buros, Renault SA head of sales for France, told BFM Business radio Tuesday that French orders are up too. “The French market has grown 5 percent on average over five years,’’ he said. “It’s quite rare, so everyone’s struggling a bit to keep up” in terms of production. In China, state-owned Kweichow Moutai Co., the world’s most valuable spirits maker, is raising the price for its signature drink for the first time in five years and implementing an average 18 percent increase across its product line. There were signs of weakness elsewhere in Asia, with factory indexes in Indonesia, Malaysia and South Korea dipping below 50 during December. Still, the global economy is forecast to expand 3.7 percent this year, slightly faster than the 3.6 percent pace estimated for 2017, according to the International Monetary Fund’s most recent projections. 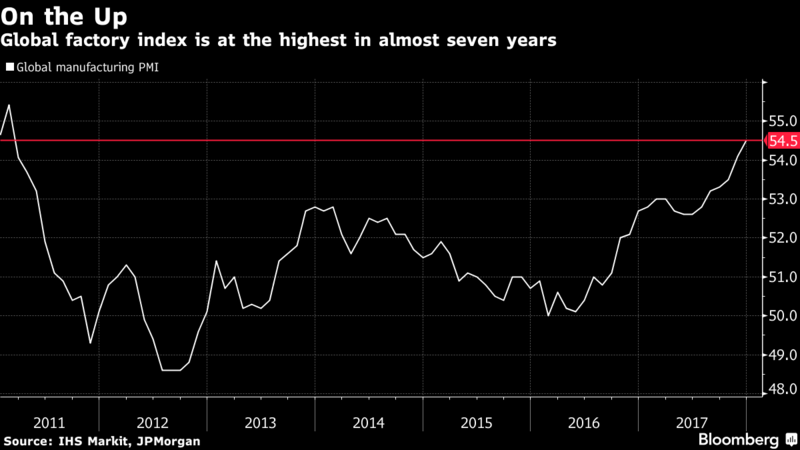 The euro area will cool slightly from 2.3 percent this year, but still record growth above 2 percent, according to a Bloomberg survey of economists last month.